For the first time ever, I managed to get shallots planted in the Fall. 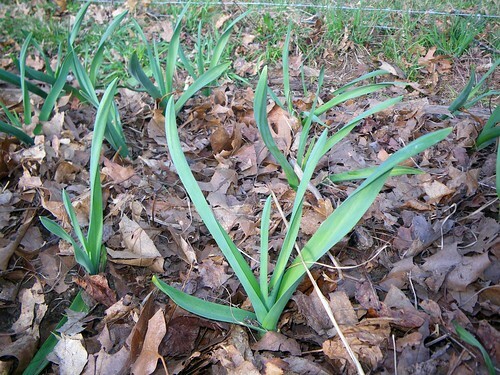 We’ve bought them several times, but never actually managed to get them into the ground. We always rotted before Spring, and often never even got planted when we rebought them. We did manage to grow some this year, but it will be nice to see how they do now that they’ve been properly planted in the fall and have all winter to take root and get an early start in the Spring. I also planted garlic and potato onions. Garlic seems to do well around here. I hope it does as well as it does down in the Monadnock region, which it loves. Potato onions are a new crop for us. I’ve wanted to try them for a while, but so it seems does everyone else, so they’ve always been sold out, or have a crop failure as the Maine Potato Lady did this year. I bought them all from Territorial Seed Company, simply because they actually had potato onions and Musick garlic (my favorite) in stock. I’ve wanted to try potato onions for a while, because they, like shallots and garlic, can be saved and replanted without going through seeds. A good thing, by the way, because they, like garlic rarely flower. The instructions from Territorial say to remove flower stalks, however Kelly Winterton has a theory, and some evidence, that most strains of potato onion are so small because of generations of retroviruses, so that a seed generation will clean out the viruses and produce better plants again. He has a pdf booklet on his site. If you’re interested, I highly recommend it. Don’t forget we have 2014 Calendars available now! Free shipping world-wide. This entry was posted in Garlic, Potato onions, shallots. Bookmark the permalink. Post a comment or leave a trackback: Trackback URL.